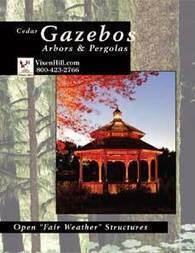 What kind of gazebo are you looking for? Why Should You Get A Gazebo? The main reason our customers love their gazebo is simply for its stunning aesthetics. It creates a graceful focal point for your outdoors. Relax, Enjoy and SHOW OFF! Whether your property overlooks the ocean, a valley, a city, fields or a creek, a gazebo is the perfect place to admire your view. During fall, the colors were beautiful and our gazebo blended in perfectly. Everyone enjoys the quietness of the Gazebo. You feel so serene there. Request a FREE catalog NOW! Your gazebo will brighten your garden in the dead of winter when all of your flowers have withered away. And if you don't, your gazebo is your view! A gazebo gives dimension to your landscape, and you will love catching a glimpse of it from your windows. What is a more romantic place than a gazebo to take some tender time for you and a loved one ? For life's precious moments, weddings, new born pictures, birthdays, graduations, and family reunions... your gazebo will be there. Host your family for a picnic while children play hide and seek. Savour a nice diner with friends at twilight with a good bottle of Bordeaux. We have gotten countless compliments on our gazebo. We absolutely lived there all summmer....it's our son's favorite reading spot. Our gazebo turned out to be even more perfect then I hoped it would. Our Gazebo is solid enough to have a squaredance with everyone jumping at once! Everyone says it is gorgeous. Thank you for providing a quality product. Your gazebo is your escape from the home its chores, worries and other distractions. This is where you can relax and recharge. A destination without leaving home. Request a FREE catalog NOW!Request a FREE catalog NOW!Request a FREE catalog NOW!Request a FREE catalog NOW!Request a FREE catalog NOW!